HONEST, WONDERFUL AND ABOVE ALL DELICIOUS FOOD! 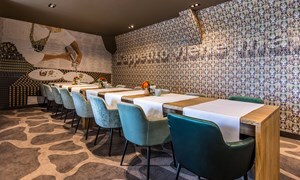 We offer various options if you wish to get together for a meeting, a break during lunch-time or a cosy family dinner. 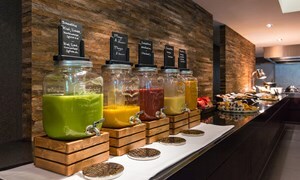 The breakfast buffet at Hotel Hengelo is known for its luxurious and extensive selection. A healthy start to the day! Our lunchbuffet is on workingdays (Monday till Friday) from 12 till 2 PM. Due to the international character of our guests, travelling to us from all parts of the world, our kitchen brigade is specialised in an international kitchen with a French-Dutch oriented touch. Every Friday and Saturday evening you can enjoy drinks and the Live Cooking spectacle. 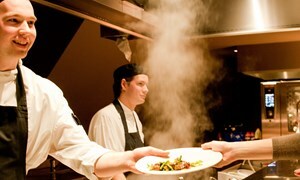 In a professional manner our cooks will prepare your dishes à la minute for you. 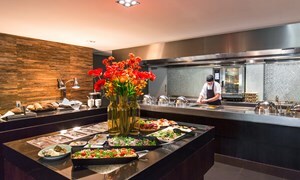 Every Sunday, between 11.30h/11.30 am and 14.00h/2 pm you are welcome at our restaurant for a comprehensive Sunday brunch. Excellent croissants with salmon. The very accurate service. The friendly and helpful staff.